Optometrist in Vancouver | See for Life- Dr. Mini Randhawa, developmental, childrens' optometrist: Can nutrition fight glare, increase contrast, help you see farther, and help you process visual information faster? Can nutrition fight glare, increase contrast, help you see farther, and help you process visual information faster? 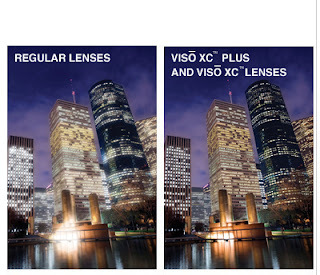 This is Viso XC lens coating that fights glare. Can the right eye nutrition do this? Much attention has been devoted lately to macular pigment (MP), which is composed of the carotenoids lutein and zeaxanthin. Macular pigment is found in a part of your eye called the retina. In fact, it is found in high concentrations in a part of the retina called the macula. People who have lots of lutein and zeaxanthin in their system have a much lower risk of developing eye diseases like cataracts and macular degeneration. Those diseases can cause permanent vision loss and blindness.